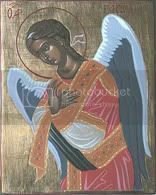 I've started praying to the guardian angels entrusted to my children. I ask them for help in raising them on the straight and narrow. I pray that they cloak them from the evils in this world by helping them to make good choices... by helping them to remember the Presence of God throughout the day. I pray to the guardian angels of any future spouses my children may have also... asking them to assist in the formation of their character and help them to maintain their purity and inclination toward God throughout their childhood. It's never too early to start! Someone said something a while ago about Pope John 23rd that I hadn't ever heard before (in fact I don't even know if it's true, but it still illustrates a great point): whenever he was going to meet someone, especially for the first time, the pope would dispatch his guardian angel to go talk to the other person's guardian angel and thus smooth things over for the initial encounter. And supposedly, it always worked! And so I've started this practice... asking my guardian angel to get together with the angels of people I'm about to meet and help make us both predisposed to the graces that may be available in our encounter. In short, our Father has given us a great gift and wonderful help through His angelic servants. They know both us, and our Lord better than any human best friend we may have; I am certain that great good could come from us communicating with them more often.